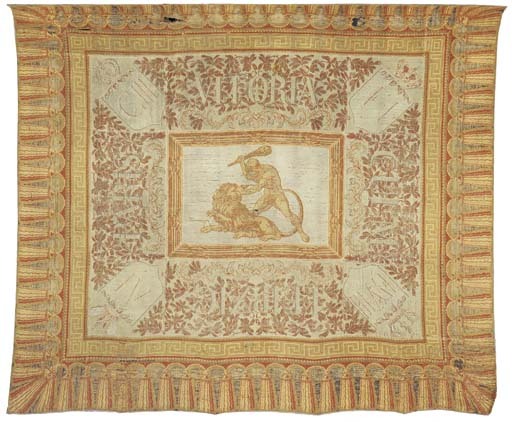 This unusual carpet commemorates battle victories that lead to the downfall of Napoleon. The battles of Vitoria, Leipzig, and Culm were all allied victories in 1813 all of which led ultimately to the unconditional surrender of Napoleon on 11 April 1814 in Paris. The initials refer to the kings of the countries with the largest armies involved: George III of Great Britain, Alexander I of Russia, Frederick I of Austria, and Frederick William III of Prussia. The omission of Waterloo from the list of battles makes certain a date of manufacture between April 1814 and the beginning of 1815 when Napoleon returned from Elba. The precise dating of this carpet makes it an important document in the history of the developement of the manufacturing of carpets which are not hand knotted.